The KD 650 is an other approach for an affordable trailer catamaran for amateur construction. 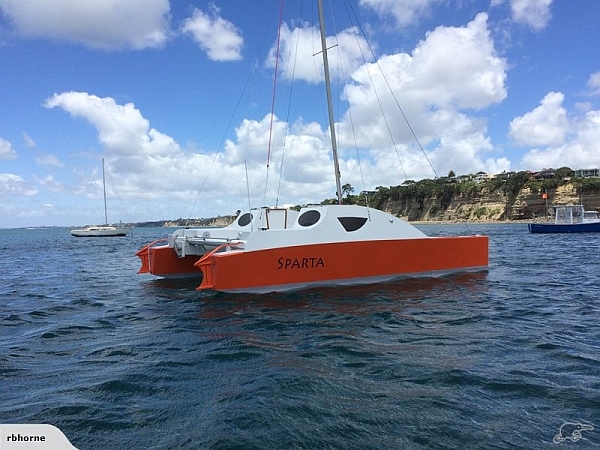 The boat is designed for coastal sailing and will have a good turn of speed with its efficient Gunter rig. 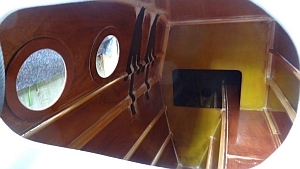 The boat is an easy to build plywood/glass/Epoxy construction. Also first time DIY boat builder will have no problem building the boat. Trough the asymmetrical hulls no dagger boards are necessary to go as well to windward as any very good mono hull. To avoid the high costs for the rig i.e. mast and rigging the boat sports a modified Gunter rig. I "modernized" the rig so that only one halyard is necessary. The yard is fixed to the mast. The mast is free rotating. The result a semi wing sail. The plan shows how to build the mast from an Aluminum tube and some hardware. The gaff is made from clear fir, UD- carbon and glass cloth. The beams are made from ready available Aluminum tubes. Besides cutting them to length nothing to do here. This will shorten the construction time by about 40 % compared to boats where wooden beams have to be build. The set up time once at your favored sailing ground is short. To make sure of this I designed a quick beam fastening system. Only four nuts have to be fastened to fix the beams. The mast is only 4,3 m long and weight a mere 9 kg. To set up the boat will take 2 persons not more as about one hour. This will be not different on a beach or in a port. Modern Gunter rig. Easy to build by your self and very efficient. Surprisingly much space on the inside. The beams are fastened with a unique quick fastening system and four nuts. Easy to transport on a trailer. Trailing wide 2m. The weight of a hull will be under 90 kgs. 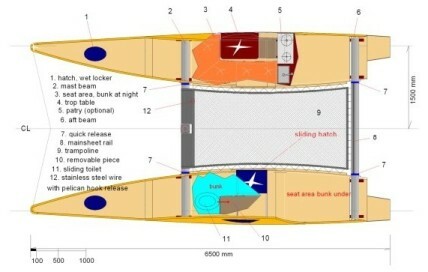 In each hull is space to sleep 2 persons. In one of the hulls is space for a toilet. Good height for comfortable sitting. A small pantry can be added. The hulls are a-symmetrical to avoid dagger boards. The a-symmetry is 1/3 to 2/3. For easy of construction AL. tubes for the beams are used.